My Firefly's new favorite is a sunshine mobile we made. 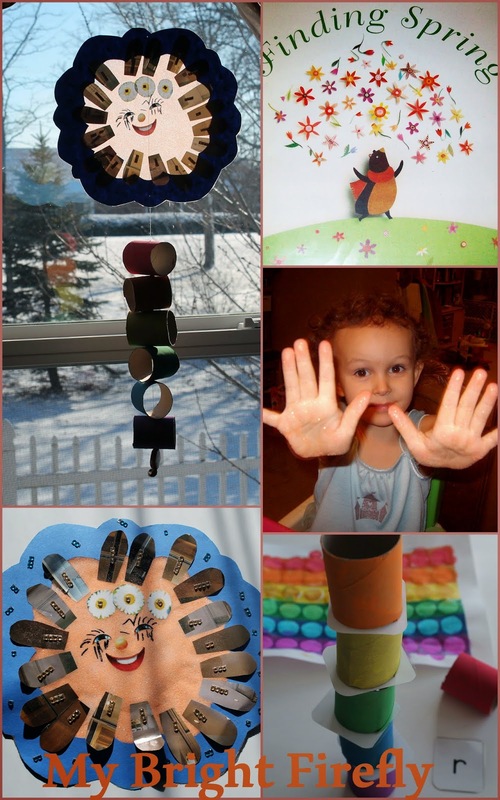 The fun collage for the sun and colorful paper tubes for the rainbow were meant to be a sun catcher, but are travelling around the house causing commotion instead. . Upcoming changes in weather and seasons got kids excited this week (thanks, groundhog!). The colorful rainbow box brought us months of play time too: D is for Dolphin. Spatial Sense - in the Coral Reef. "Finding Spring" by Carin Berger is our very favorite book of the week. Maurice, a baby bear, is looking for his first spring. Is it hard to find? He is leaving his Mama in the bear cave and running to the woods. His adventures are easy to follow with 1-2 sentences per picture. The illustrations are a simple miracle! They didn't draw my attention first. But my 3 year old started staring at each of them finding new details every time. The pictures are collages made with cut outs from the magazine pages. They are simply awesome! The pages from old magazines easily bring the special effects to a collage and have just the right texture for the contact paper. My Firefly had lots of fun with them. I quickly precut the pieces for the collage free hand. For the base, I cut out the blue cloud leaving a window inside. Then I placed it onto the contact film, covered it with the backing sheet, cut it out, and removed the backing. I helped My Firefly with placing the eyes. The eye lashes are her favorite - everything has to have eyelashes nowadays. They were drawn with the dry erase marker. Adhesive back acrylic gems were used for the decoration - excellent for fine motor skills practice. We have our glitter in the salt shakers. The colored sand mix is a lovely sensory play. My Firefly shook it over the collage and finished by spreading it with her hands. Lots of smiles and giggles there. We reviewed the colors with the simple and nice Rainbow Do-a-Dot Worksheet from Gift of Curiosity. Then My Firefly picked the paint according to her completed worksheet. The tubes were cut in half and painted. The next day, we played with them before assembling into the mobile. Rebuilding a rainbow again and again helped to learn the colors - and review the letters. This little one is really looking forward to spring!